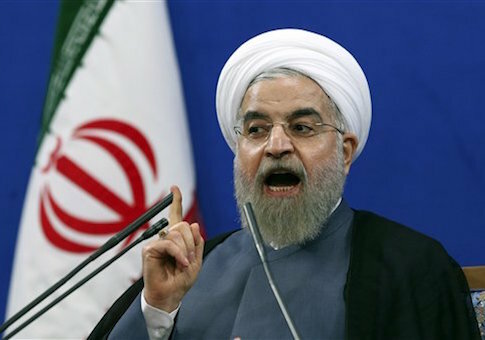 Iran has threatened to walk away from the recently inked nuclear deal and stop rolling back its nuclear enrichment program, according to recent comments by Hassan Rouhani, the Islamic Republic’s president. Rouhani, in comments on Thursday, threatened to break the deal if the United States imposes any new sanctions on Iran, even ones concerning the country’s human rights abuses and its ballistic missile program. The comments are a direct response to promises by the Obama administration to continue pursuing economic sanctions targeted at Iran’s terrorist proxies and efforts to foment unrest across the globe. The warning from the Iranian president was delivered amid bipartisan calls in Congress to increase pressure on Iran in response to its recent arrest of two Americans, one a dual citizen and one a D.C.-based permanent resident. Iran "will not fulfill agreements" aimed at curbing its nuclear program if any new sanctions are considered, Rouhani said, according to reports carried by the country’s state-controlled media. "The obligations are the following: the group of six [global powers] will not impose new sanctions, and we should fulfill the agreements," Rouhani said. "In case the Unites States or other countries fail to comply with their obligations, we will be forced to do the same." Rouhani’s made these comments just days after reports emerged indicating that Iran has stopped dismantling its nuclear centrifuges, a key requirement of the agreement. Major differences between the United States and Iran have arisen on the issue of sanctions. While Iran maintains that all U.S. sanctions must be terminated, the Obama administration says it is only required to suspend nuclear-related sanctions. This leaves open the possibility that the United States could reintroduce sanctions if Iran violates the deal and could level new sanctions unrelated to the country’s nuclear program. Rouhani acknowledged that this has caused tension between the two nations, stating in his remarks, "a U.S. decision to withdraw only nuclear-related sanctions on Tehran but keeping other restrictions in place has led to continuous disagreement between Iran and the United States." The Iranian president also demanded in his remarks that the United States "apologize" for its past actions against Iran. "If they [the U.S.] modify their policies, correct errors committed in these 37 years and apologize to the Iranian people, the situation will change and good things can happen," Rouhani said. "The Obama administration may insist that the nuclear deal is somehow isolated from other bad behavior on the part of the Islamic Republic, but the fact is that this is all part of the same ugly pattern," Cruz said. "Tehran understands perfectly well that the terrorist activities of the Revolutionary Guard, including the detention last month of American citizen Siamek Namazi and American resident Nizar Zakka, are part of the same anti-American hostility that also fuels their nuclear program." "Trying to separate out their activities is a fool's errand," Cruz said. "There can be no good-faith deal with a regime that is the world's leading state sponsor of terrorism and that has been targeting America and our allies for 36 years." The Obama administration has reserved the right to pursue new sanctions. The State Department explained to the Free Beacon earlier this week that it will not remove sanctions relating to certain elements of Iran’s Revolutionary Guard Corps, an organization responsible for waging terror attacks. Other sanctions aimed at curbing Iranian human rights abuses also remain in place. However, the State Department has declined to go further with its sanctions against the corps, telling the Free Beacon that it is not considering designating the military group as a foreign terrorist organization, which could severely restrict its activities. "We believe the sanctions we have in place remain the most appropriate and effective tools for targeting the IRGC, and we are making full use of such authorities with respect to the IRGC," a State Department official told the Free Beacon this week. "In addition to Iran’s designation as a State Sponsor of Terrorism, we have a substantial set of sanctions already in place against the IRGC." Questions still remain about whether the United States will respond to the recent arrests of two American citizens in Iran. While members of Congress have called for sanctions as a result of the arrests, the administration has balked. Sen. Mark Kirk (R., Ill.), among other lawmakers, has demanded that the Obama administration work with lawmakers to strengthen sanctions. "Iran's threatening behavior will worsen if the administration does not work with Congress to enact stronger measures to push back, including renewal of the expiring Iran Sanctions Act of 1996 and targeted sanctions against Iran's Revolutionary Guard and against any Iranian official found to have participated in the unjust detainment of American citizens," Kirk said in a statement. "It should come as no surprise that Iranian leaders are trying to blackmail the administration into ignoring Iran’s terrorism, human rights abuses, tests of missiles that can strike Israel, and detention of American citizens," Kirk told the Free Beacon. While Congress has red lines that Iran passed long ago, the question is whether the administration has any red lines." Iran is pursuing a policy aimed a tying the White House’s hands, analysts said. "Under the deal Iran always has a gun to America's head," said Omri Ceren, managing director for press at The Israel Project, a D.C.-based organization that has been critical of the final terms of the deal. "Any time the Iranians don't like anything the U.S. is doing, they can blackmail Washington by threatening to walk away from the deal. " "This time they're telling Congress that lawmakers are prohibited from responding to the arrest of American citizens," Ceren said. "Who knows what they'll ban the U.S. from doing next time?" Michael Rubin, a former Pentagon adviser and expert on rogue regimes, said that these types of threats by Iran are a hallmark of the hardline administration. "It's the traditional Tehran two-step: One step forward and two back," Rubin said. Iran is comfortable issuing threats because it has already begun to receive sanctions relief granted under the nuclear accord. Tehran also has leverage over the Obama administration because of the way the deal is structured, according to Rubin. "Kerry's team played into Iran's hands by front-loading Iran's rewards and removing any incentive for Tehran to adhere to commitments," Rubin said. "Who besides Obama and Kerry would give a rogue regime and the world's largest state sponsor of terrorism a free pass against consequence for any of their actions?" "Kerry essentially handed Iran a get out of jail free card, and the Iranian leadership will respond by seeing how far they can push," Rubin explained. "Obama stays quiet on the arrest of reporters or businessman? Well, why not execute one or two and see what happens then? Obama ignores Iranian shipment of missiles to Hezbollah? Why not launch a few?"